Today I got on the train again, to visit an old friend who has been very ill. In the past he used to drive from Holland to Scotland to visit his son and without fail he would stop by to see us, either on the way back or going. Unfortunately he has not been able to do that for a while and being here in The Netherlands I very much wanted to see him. It was quite nice to get away from very crowded and almost stifling Rotterdam: it’s a great city but very relentless, especially when you live temporarily right in the centre. Also, I needed a break from the DIY that is constantly clamouring for my attention in this flat, over and above the TLC! My friend lives in a polder and recently the polders have been much in the news. Whereas the Dutch used to congratulate themselves on their cleverness and technical ability to dry out the sea in order to make rich farmlands in polders surrounded by dykes, geologists and scientists are now questioning this approach: the polder land is sinking, because no natural depositing takes place which would encourage the land to grow higher. At the same time the sea levels are rising so that, should there by a break in the dykes as for example happened in 1953, the disaster would be even worse than what happened then. So the logical conclusion is that some of the land should be given back to the sea for it to be able to do its work: the deposits by the sea that will encourage the soil to grow upwards. Fascinating, don’t you think? I was contemplating all this whilst I sat on the train which passed so many familiar places: Leiden, Delft, Amsterdam and on to Almere. Especially on the first lap, there are buildings everywhere, blocks of concrete, haphazard, then come the water channels, the ditches, drowned land, puddles, bare trees covered by the grey sky, with an odd farm here and there, well kept meadows and electricity cables running from one pylon to another, a football pitch and then more vegetable gardens. 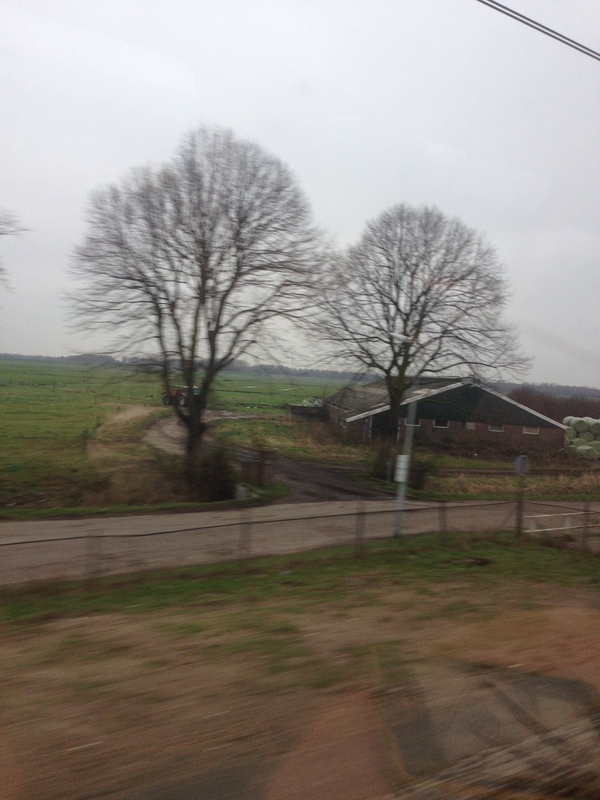 At Delft station there was the view of the bicycle racks with thousands of bicycles, spray painted walls, desolate blocks of flats and then into the countryside again with bare trees, and everything so flat. We cross the water of the Ijmeer before we enter Almere, a town in a Dutch polder, which seems a million miles away from he hustle and bustle of Rotterdam, even though it’s only an hour and a half on the train.